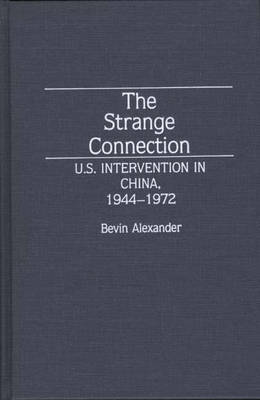 This book provides an analysis of American intervention in China from World War II to the rapprochement Richard Nixon began in 1972. One of the major themes of the work is that the United States should avoid judging China by Western standards. The United States learned this after twenty-eight years of attempting to impose its own standards of democratic, representative government on China. Alexander also contends that the United States acted against its own interests when it supported the Nationalists and that the United States accused the Chinese Communists of aggressive policies in East Asia when, in fact, they did not pursue aggressive policies. The book traces the origins of the American interest in China, based on Roosevelt's hope to use China as a partner of the United States to preserve the peace in East Asia. It covers the U.S. failure to realize that most Chinese people supported the Communist revolution and the U.S. attempt to keep the reactionary Nationalists in power after they lost the Civil War. Next, the work considers the misconception that Red China was an instigator of the Korean War, the U.S. attempt to destroy the North Korean state, and China's decision to intervene to prevent American forces from proceeding to its frontier. The text also traces the adoption of Taiwan as an American protectorate, the flirtation with atomic war to protect the Nationalist-held islands of Quemoy and Matsu, and the decades-long U.S. policy of denying Communist China a seat at the UN. The work concludes with Nixon's decision to recognize China because U.S. policy was threatening world peace and order.